Delaware Arts Info: Love is in the Air at The Delaware Theatre Company! Love is in the Air at The Delaware Theatre Company! Michael Learned and Daniel Davis in Love Letters. Photo by Joe del Tufo, Mobius New Media. You can take a trip to New York City to see the latest starry Broadway revival of Love Letters, but there is no need to travel to the Big Apple when we have our very own starry production right here in the First State! Last night the Delaware Theatre Company opened its 36th season - with A.R. Gurney's sentimental two-character play starring Michael Learned and Daniel Davis - to a standing ovation. 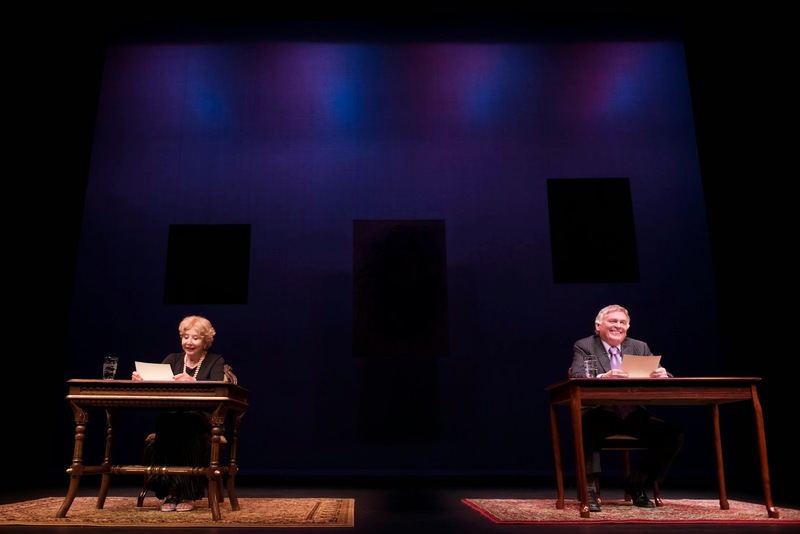 Love Letters is a unique play because the two actors never physically interact; instead, they sit at separate desks reading letters their characters have written to each other over the course of about 50 years. Since there is no blocking, sets or props, the play depends solely on the strength of the actors. Thankfully, we have two veterans in the roles who can certainly handle the challenge. The two characters come from waspy New York families. They both spent their formative years in boarding schools and summer camps, but the families couldn't be more different. Melissa Gardner (Ms. Learned) grew up with divorced parents who used their wealth to keep their daughter happy rather than give her the attention she longed for, while Andrew Makepeace Ladd III (Mr. Davis) grew up in a conservative household with loving, supportive parents. The play begins in the 1930s when they meet in second grade, and thus starts their lifelong love affair. We learn about each character's personal and professional successes and failures through the letters they write to each other as they attend out-of-state schools and continue their very different lives. They both journey into adulthood in separate directions. Andrew becomes a Washington, DC lawyer and later a republican New York senator, while Melissa becomes a free-spirited artist who uses her family's money to travel the world. Although both have multiple relationships and marry others, with whom they have families, they never stop corresponding. The beauty of the play is that it comes to life through Mr. Gurney's words. The audience gets an opportunity to mentally visualize the action rather than have it played out for them. It's a play about these two people, but it's also about the art of letter writing, which today has been mostly replaced by technology - emails, texts, social networks, etc. As Melissa becomes dissatisfied with writing, Andrew reminds her of the beauty of it and how it's an extension of him. He feels that his letters are gifts. The two do correspond at times by phone, which we learn of their conversations through their letters, but they always return to the art of letter writing. Ms. Learned and Mr. Davis both give exceptional performances. Their delivery is captivating and engaging. They have the difficult task of bringing these characters alive through only their vocal and facial expressions. Stay in our great state to see this wonderful production. Love Letters runs through October 5. For information and/or to purchase tickets, visit www.delawaretheatre.org or call 302.594.1100.